Review At first glance, Asus' P5E-VM HDMI looks like a regular Micro-ATX design with the usual crop of integrated features. But when you take a good close look you’ll see just how much Asus has managed to cram in. 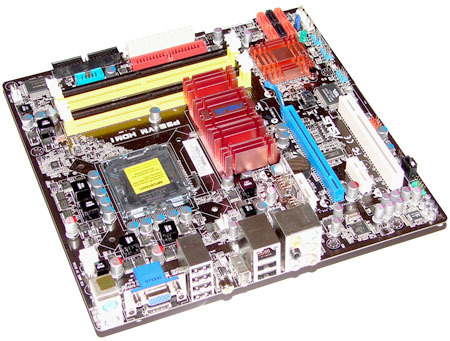 The board's Intel G35 chipset supports LGA775 Core 2 processors, including the latest 'Penryn' chips, on a 1333MHz FSB. 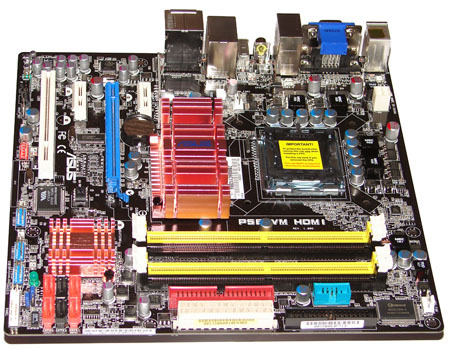 The four memory slots can accommodate up to 8GB of 800MHz DDR memory. There’s a PCI Express (PCIe) x16 expansion slot, a couple of PCIe x1 slots and a PCI slot, and also you get stacks of options for storage. In addition to a floppy connector and an ATA-133 connector that hangs off a JMicron controller, there are six 3Gbps SATA 2 connectors with every form of RAID that you might care to try, courtesy of the ICH9R southbridge I/O chip. The only possible quibble here is the absence of eSATA. Above the top-most PCIe x1 expansion slot there’s a curious riser card that carries a chip which is printed with the legend ASM4136. We have no idea what this hardware does - we're awaiting an answer from Asus on this one. You don’t get any brackets in the package but even so the list of ports and connectors is extensive. On the I/O panel there are two legacy PS/2 ports for mouse and keyboard; six USB 2.0 ports with three headers on board for six more ports if your case supports them; six audio jacks and a coaxial digital output for the Realtek audio; and a single Firewire port. Gigabit Ethernet is provided by Atheros, which is the first time we’ve seen Atheros silicon on a motherboard, but the really interesting thing here is the integrated graphics - and that’s not something we often say about Intel hardware. The G35 chipset includes the GMA X3500 graphics core, which is based on the GMA X3000 from the G965 chipset that was released last year. The X in the GMA model code marks a significant break from previous Intel graphics cores which were, to be frank, a bit feeble. Intel didn’t spell out the details of the G965 at launch so we were somewhat taken by surprise to find that a driver update transformed this Shader Model 2.0 part into a Shader Model 3.0 chip. It turned out that GMA X3000 used eight unified shaders instead of discrete vertex and pixel shaders so the initial driver release reported that the core supported Pixel Shader 2.0 and had no hardware vertex shaders. A driver update made the graphics core compliant with Shader Model 3.0 and DirectX 9.0c so Intel was able to get the hardware out of the door and then continue to work on its development in a gallant effort to fully support the Aero interface in Windows Vista.